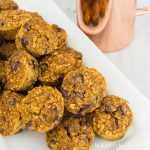 These gluten free pumpkin muffins with chocolate chips make the perfect healthy breakfast, snack, or dessert! 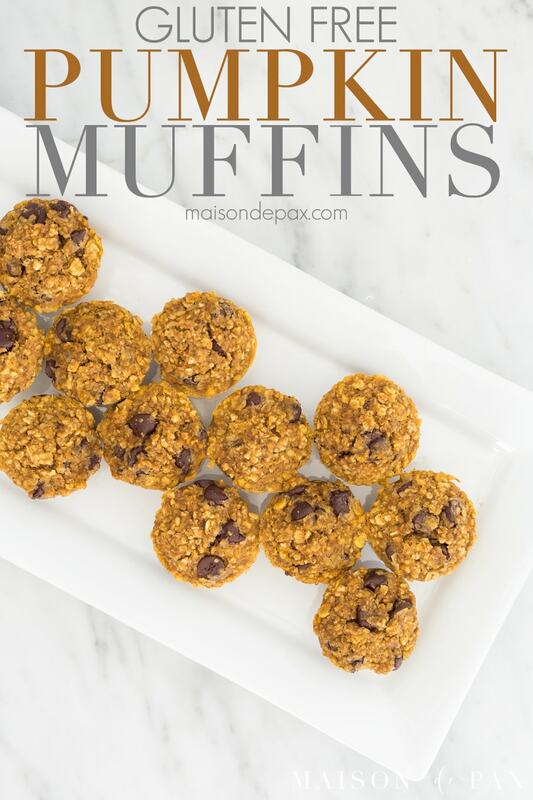 Made with applesauce and a touch of maple syrup for sweetening, oat flour, and pumpkin, they’re packed with delicious flavor and nutritious ingredients. And all twelve were gone in about five minutes. Every. single. kid. asked me for a second one. And when you see how healthy the ingredients are, I think you’ll be as amazed as I was. Ever since I discovered my wheat allergy, breakfasts have been tough for me. Many of the things I can now eat – oat pancakes, eggs, sausage, etc. – require cooking each morning… And I really need some grab-and-go options. 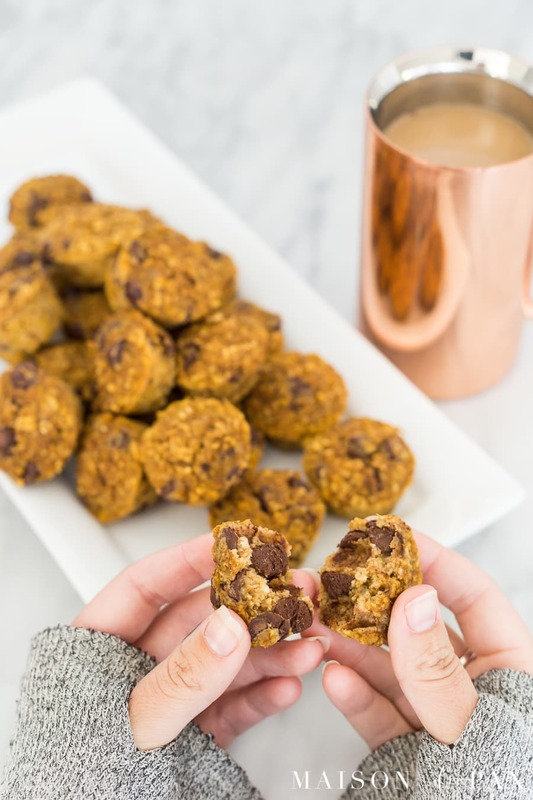 But many of the “gluten free” frozen options are just rice and other processed substitutes and not whole grain, and the breakfast bars are just filled with sugar… in other words, I didn’t love those options either. Enter these muffins. 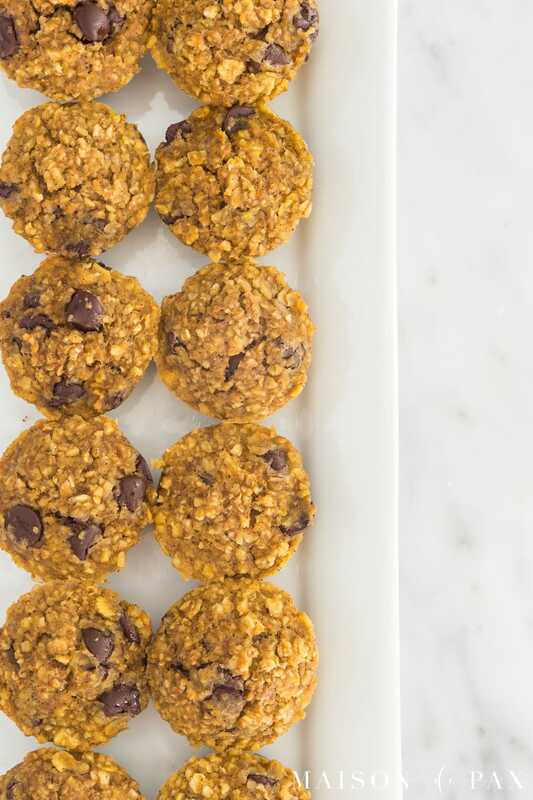 Made with applesauce and a touch of maple syrup for sweetening, oat flour, and pumpkin, these gluten-free muffins are packed with delicious flavor and nutritious ingredients. 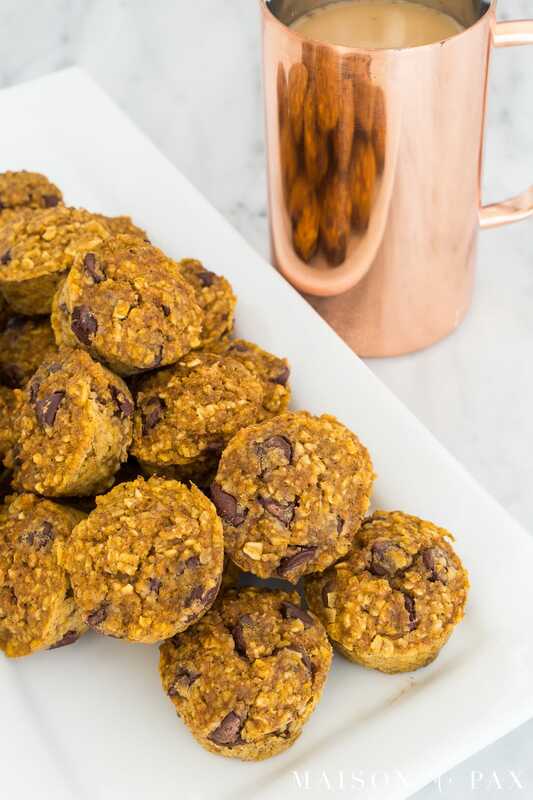 This recipe will make approximately 15-18 full sized muffins, and they're just as delicious as the mini ones! Sometimes I have trouble finding oat flour; when I do, I simply make my own by putting oats in a food processor until it is smooth (approximately 1.5 cups of oats will make about a cup of oat flour). If sugar is a concern, feel free to leave out the maple syrup; I've made them both ways, and while I like the slightly sweet touch of the syrup version, the other is still delicious. Again, if sugar is a serious concern, feel free to cut back on the chocolate chips; I do recommend dark, bittersweet chocolate (70% cacao is my favorite) for more chocolate flavor without as much sugar. If you are a big pumpkin spice fan, feel free to increase the amounts of spices for a stronger flavor. 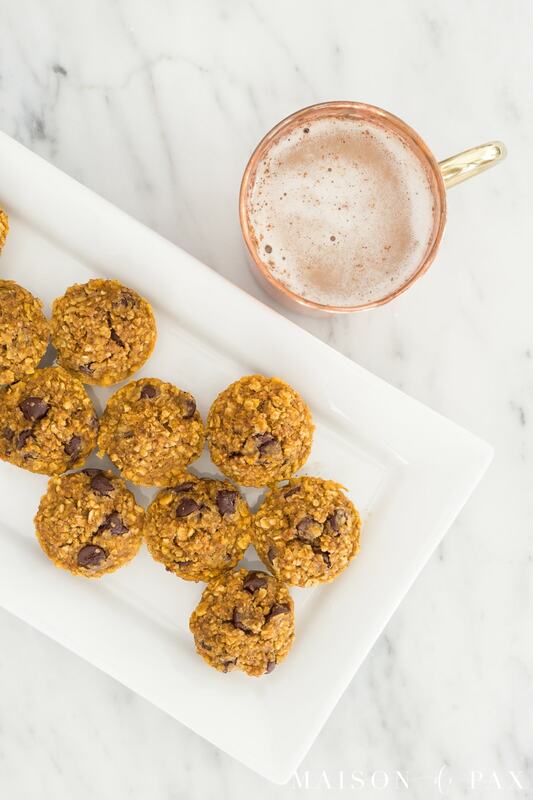 Keeping a batch of these on hand for breakfast!!! Can’t wait to make this recipe, yum!!! Thanks, Chloe! I hope you enjoy them, friend!! Thank you, sweet Jamie! I hope you enjoy them! I need to make these for my aunt! 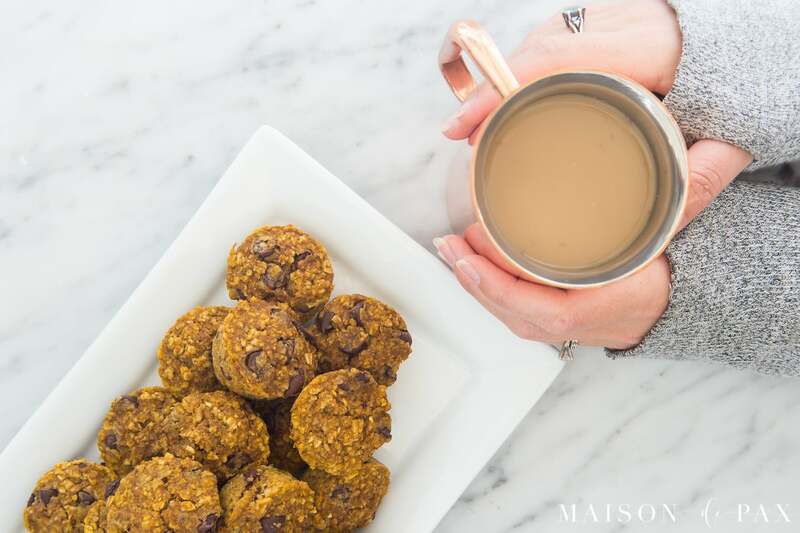 She can’t eat anything with gluten and I’m always needing new yummy recipes for her. Thanks for sharing! I’ll be baking up a batch soon! Wonderful, Sue! I hope you enjoy them as much as I do!! Hope you enjoy it, Elisha!